You guys! 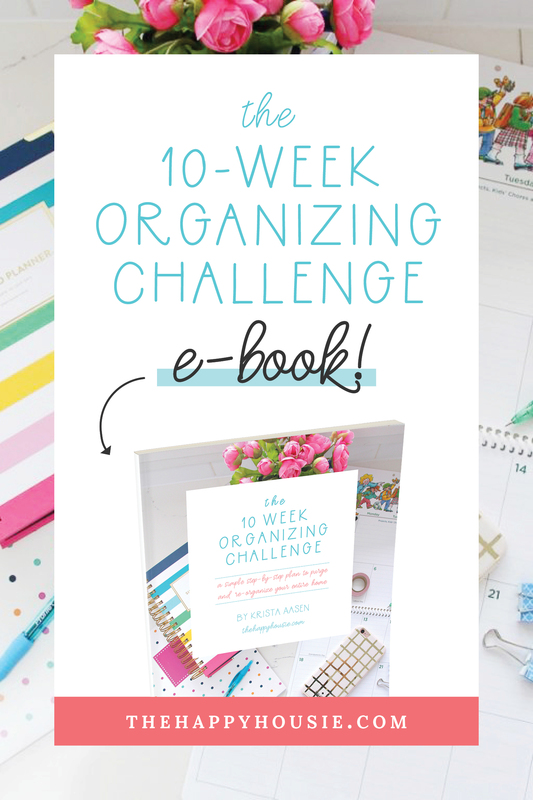 I’m so excited about today’s post! 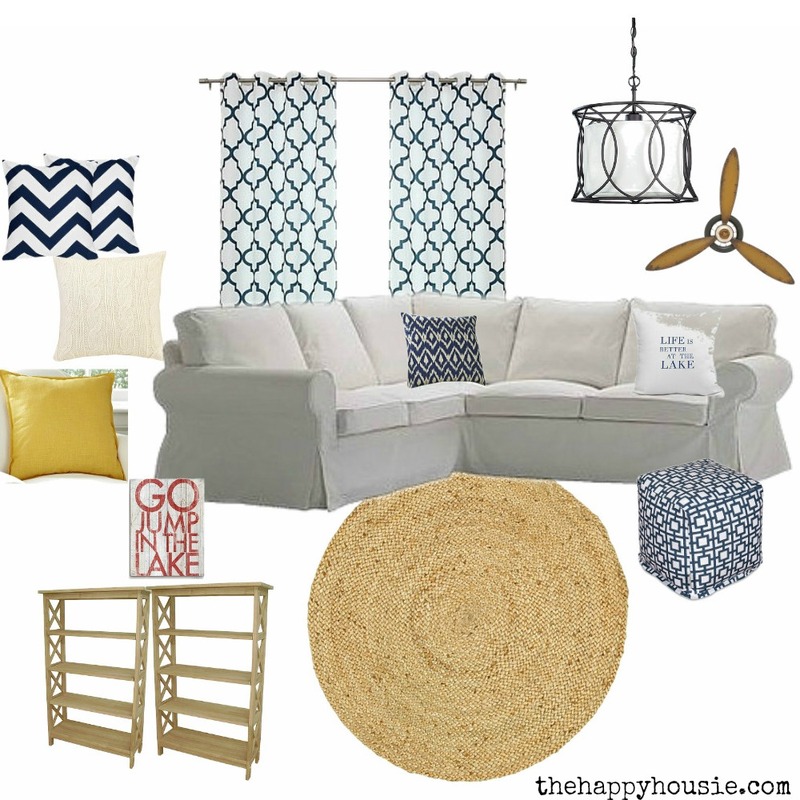 Did you see my Cozy Coastal Navy and White Living Room Inspiration board last week? Well, we’ve finally pulled all the pieces together and I couldn’t be happier with the results. We even have overhead lighting!! Talk about refreshing our home to combat the dreary winter – the crisp and fresh navy and white colour scheme is exactly what we needed to get through the next few months of grey and rain. 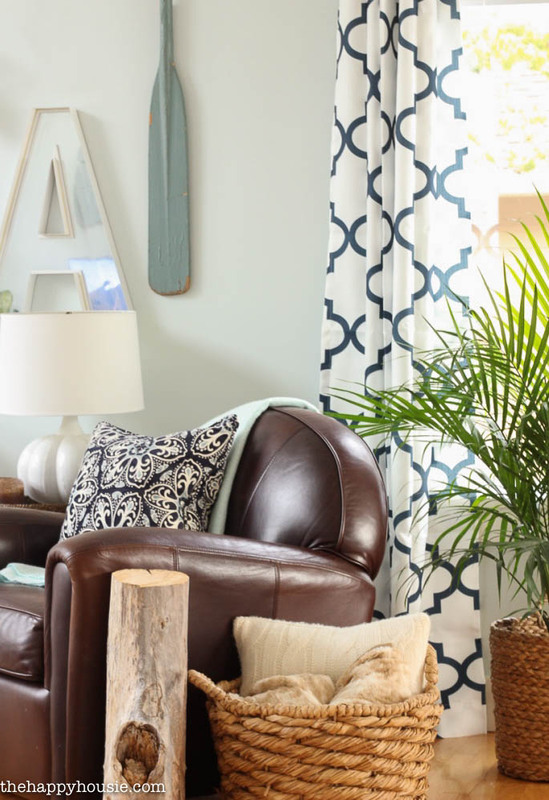 I am thrilled to be collaborating with Wayfair Canada on this living room refresh for winter. 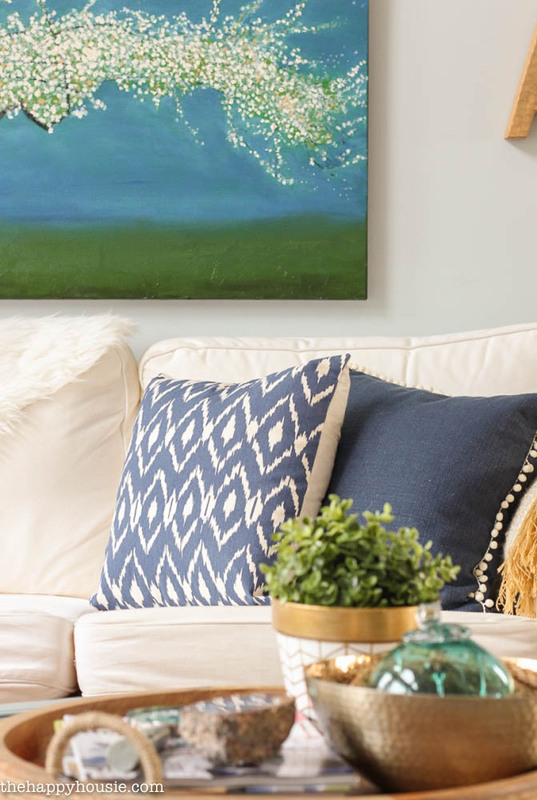 Just this past month, Wayfair has come to Canada with Wayfair.ca and I couldn’t be more excited about this awesome home decor source now being more readily available for those of us who live north of the border. 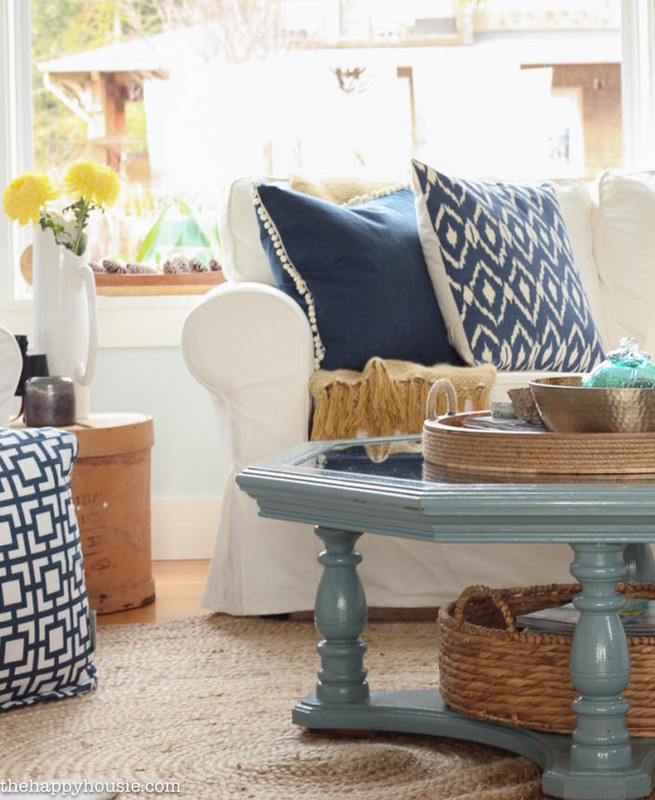 I think the biggest change has to be the dramatic impact that these gorgeous Oxford Basketweave Reverse Moroccan navy and white drapes have had on the room. Our previous drapes were also a geometric pattern, but in aqua and beige. 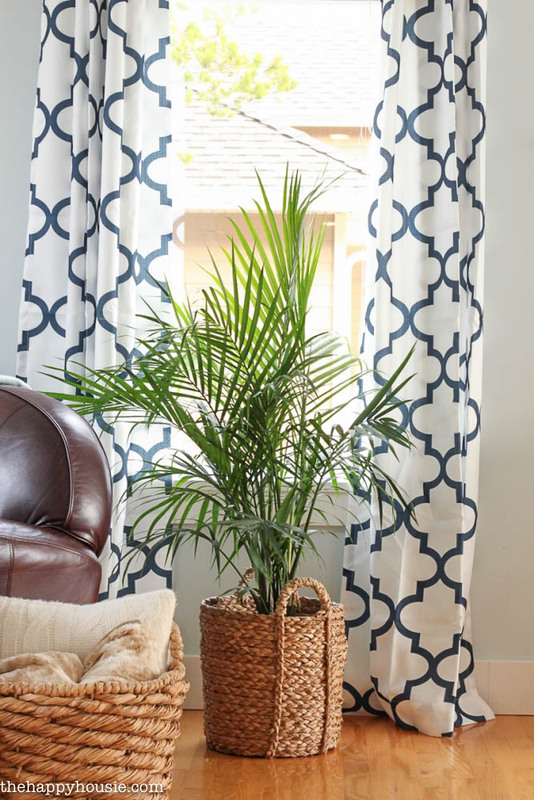 The white background of this fabric makes the new drapes pop and gives a completely refreshed look to the room. 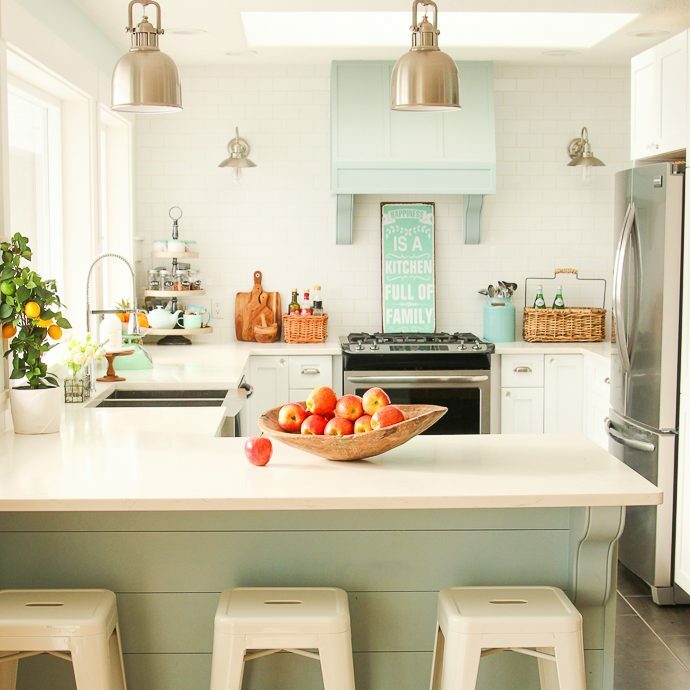 And I love the way they work with our light blue walls. And that light fixture?!?! I know, right?! The new Monica Three Light Drum Pendant fixture replaces an old ceiling fan that we only used about 3 times in the 5 years we’ve lived here. It’s so fabulous to have lighting in this room – it was so dark before and you couldn’t even read by the lamplight in the evening. I tell ya, this new lighting has completely transformed our winter. 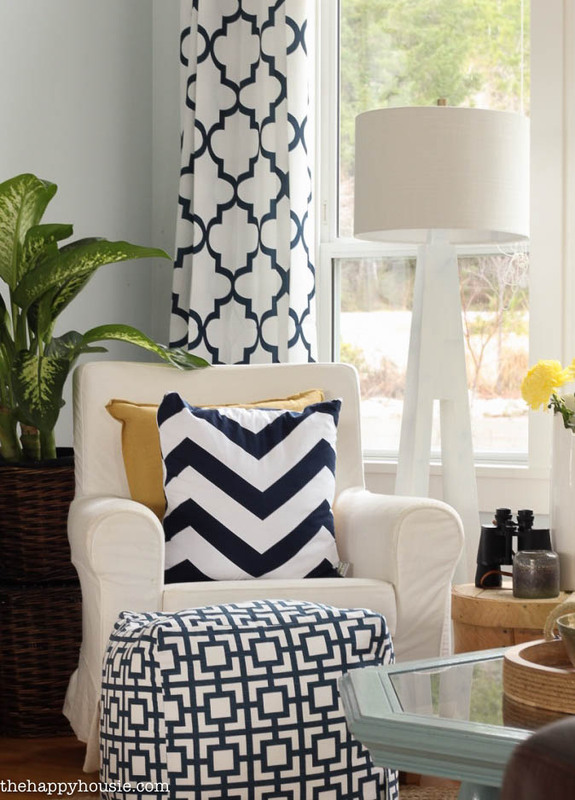 The Tara Ikat navy and white pillows pop perfectly against my plain navy pillows – and tie in really well with all the other navy accents in the space. I love how the painting by my talented brother-in-law ties the whole scheme together so beautifully. 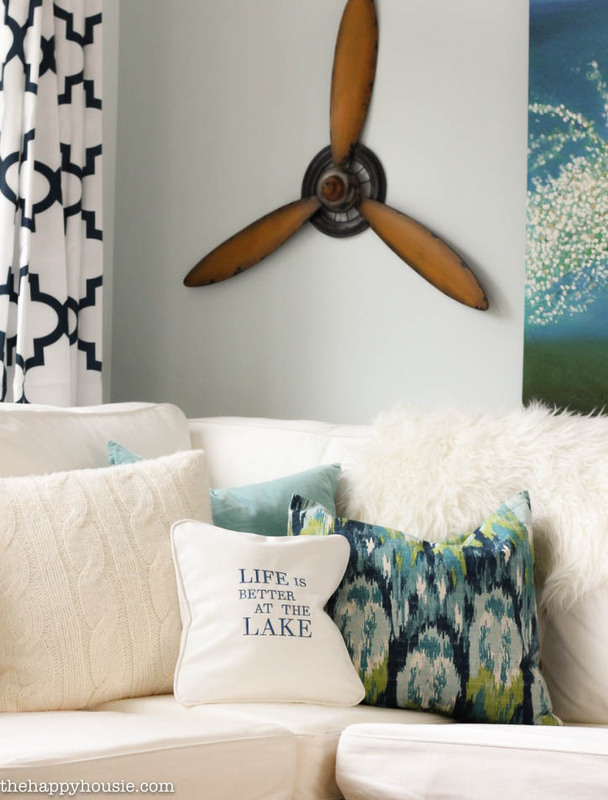 And another fun new touch is the Vintage Propeller Wall Decor that I hung on our gallery wall – I’ve tied the yellow tones in through a couple of throw blankets that I already owned. They blend well with all the natural wood and the sisal rug as well. And as a cheeky little touch I chose this Life is Better at the Lake embroidered pillow in navy and white. 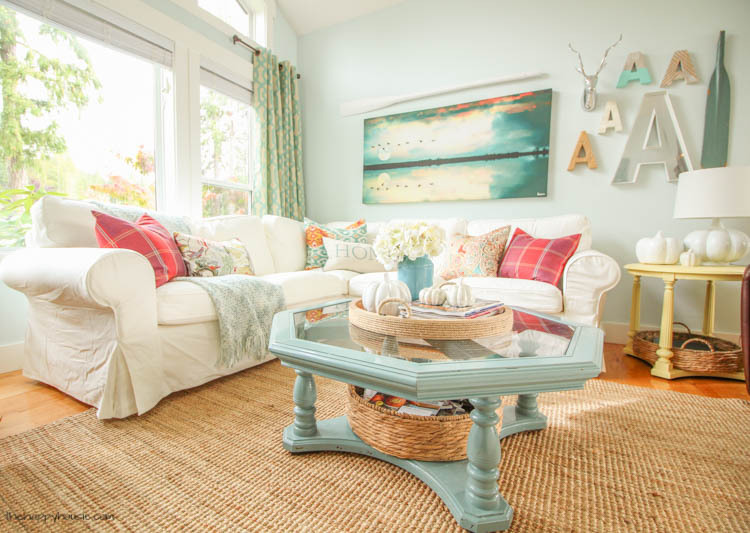 Speaking of the 8′ round sisal rug, I love the feel that having a round rug gives the room. 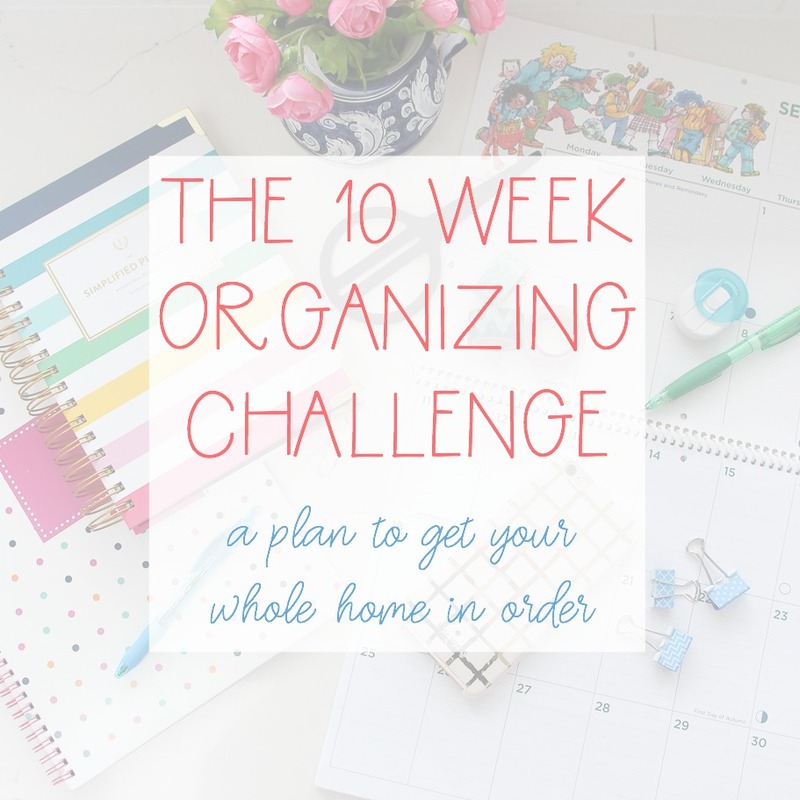 I think it works so much better in our space because the room is actually quite square in shape, and a rectangular rug always felt a bit awkward – especially once we got the sectional sofa. I added some Milly Pillow Covers in an earthy yellow colour and popped these adorable navy and white chevron pillows in front. The navy and white bean bag chair/pouff is my boys’ favourite new piece. It is comfy to sit on or to use as an impromptu ottoman. 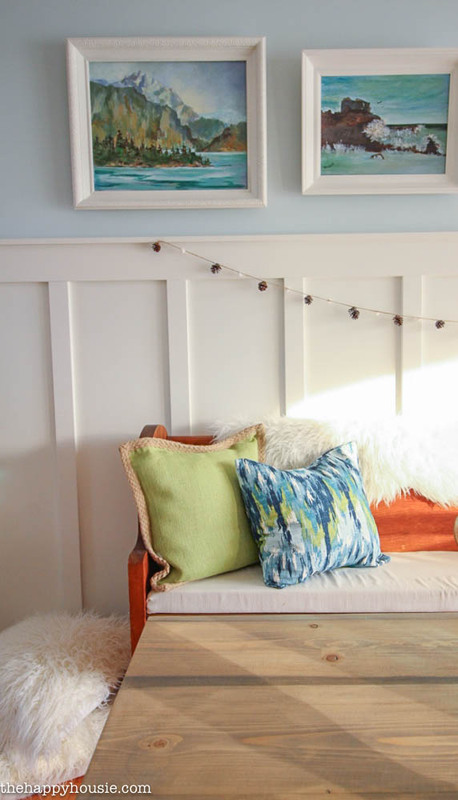 I also added some gorgeous green and jute pillows to the pew in the dining room – and my little DIY pom pom and pinecone garland adds a simple winter touch to the board and batten wall. Oh!! Another favourite change is the two new International Concepts Unfinished Four Tier X-bookshelves that we ordered to replace our faux mantel cabinet. I love how light and airy they feel compared to having a big cabinet on that wall- and of course it’s so much fun to play around with styling them. They came in a beautiful unfinished wood finish- but I plan to either stain them with the same weathered grey stain as our dining table, or to paint them white. 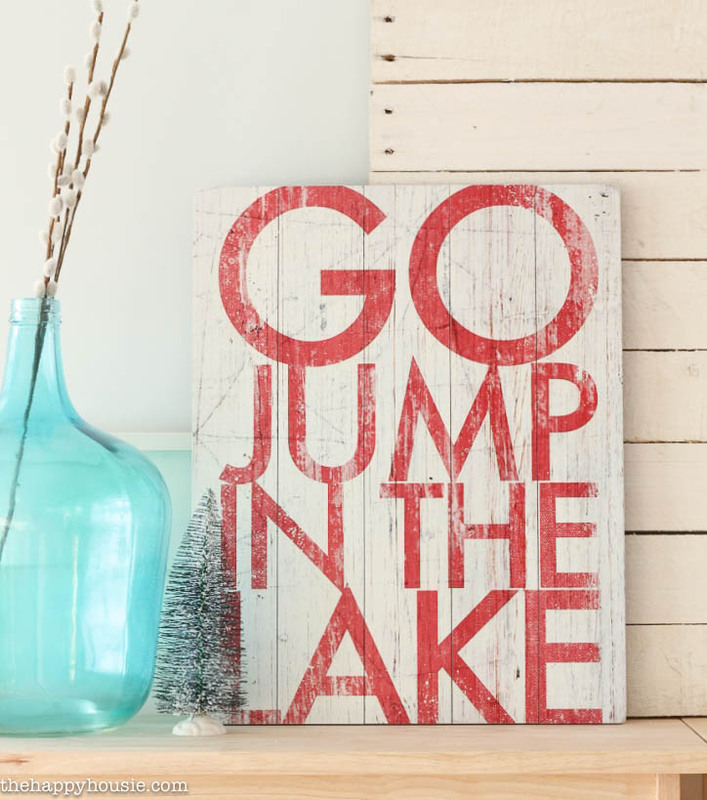 And, while jumping in the lake without a wetsuit isn’t highly recommend in the middle of January, I thought this Go Jump in the Lake sign added a fun touch of humour and colour. 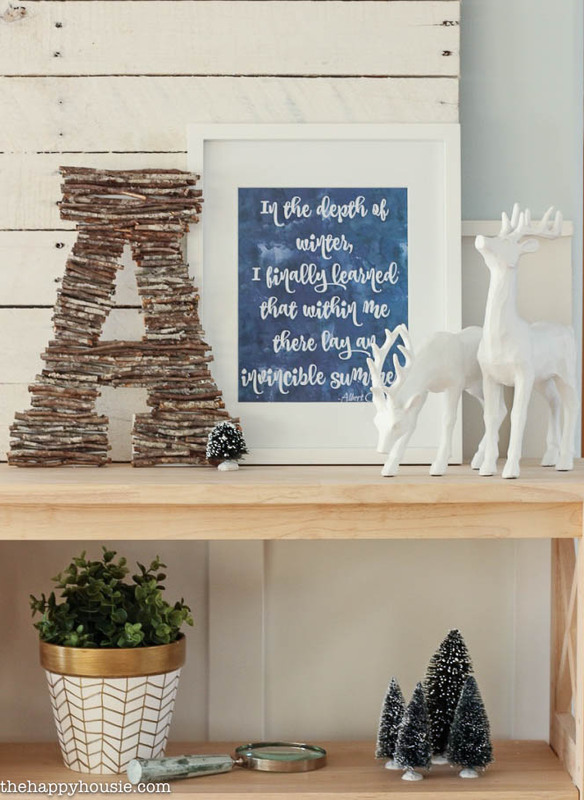 My DIY Twig Letter and Free Printable Watercolour Winter Quote Sign that I shared a couple of days ago both adorn the other side of the top of the bookcases. 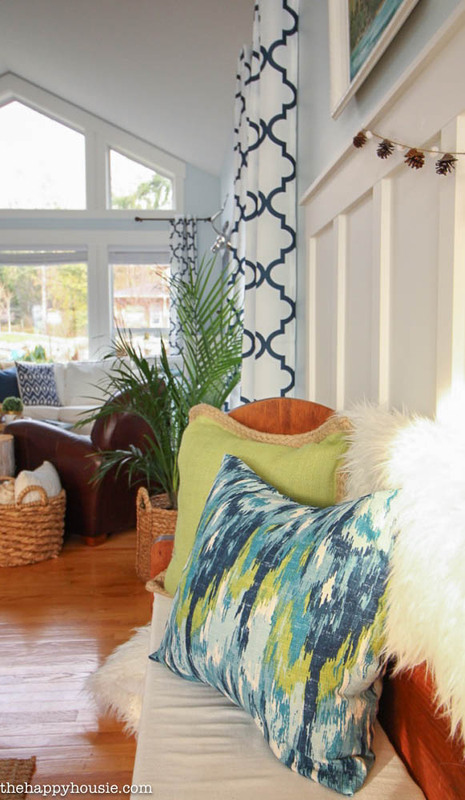 You might also enjoy taking our Fall Home Tour…. 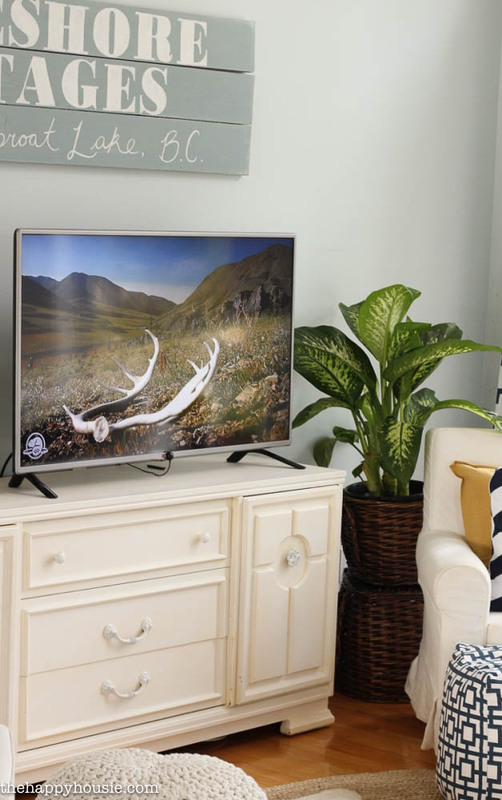 Disclosure: I am thrilled to be collaborating with Wayfair.ca on the launch of their site into Canada. All opinions are 100% my own! 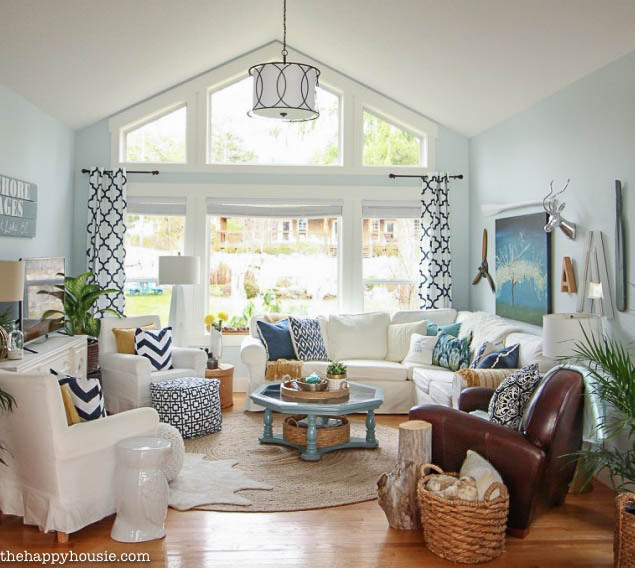 The home is really light and bright. I enjoy seeing the contrast between the navy blue and white colors, looks fantastic. I love all the blue & white!! Great choices, Krista. So excited to order from Wayfair. ca now!! So gorgeous! I love how airy and relaxed it feels while still having tons of style! The pops of navy are perfect! 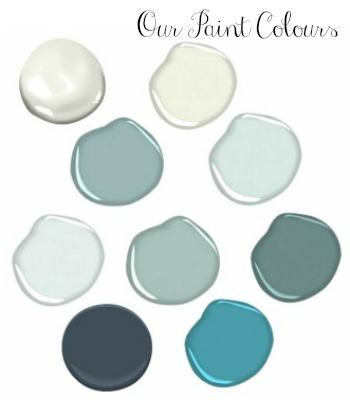 I love everything you did but I was wondering what color did you use on your walls? I’ve been back and fourth between using SW sea salt or repose gray. Hello Suzanne! 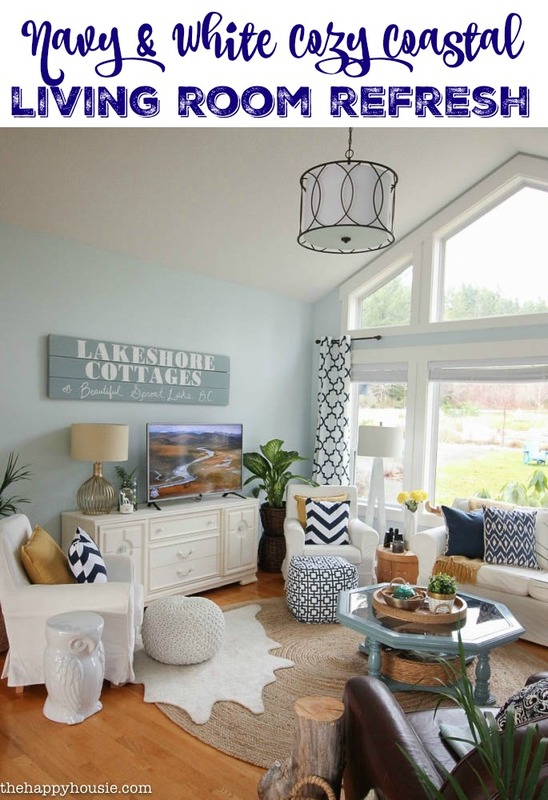 The living and dining room walls are Whispering Spring by Benjamin Moore. I haven’t used Sea Salt myself but it also looks lovely – and I have used Ocean Air in my bedroom and it is a lovely soft aqua blue. Healing Aloe also looks lovely, but again, I haven’t tried it myself and it is a little more greenish I believe. Good luck!! 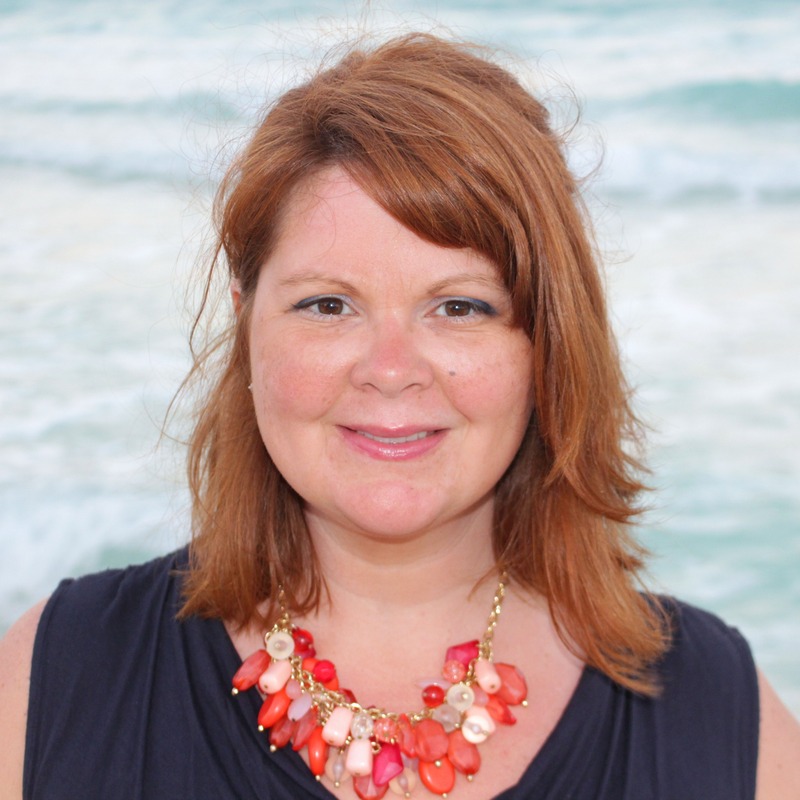 I love every single coastal detail, Krista! What a beautiful space. 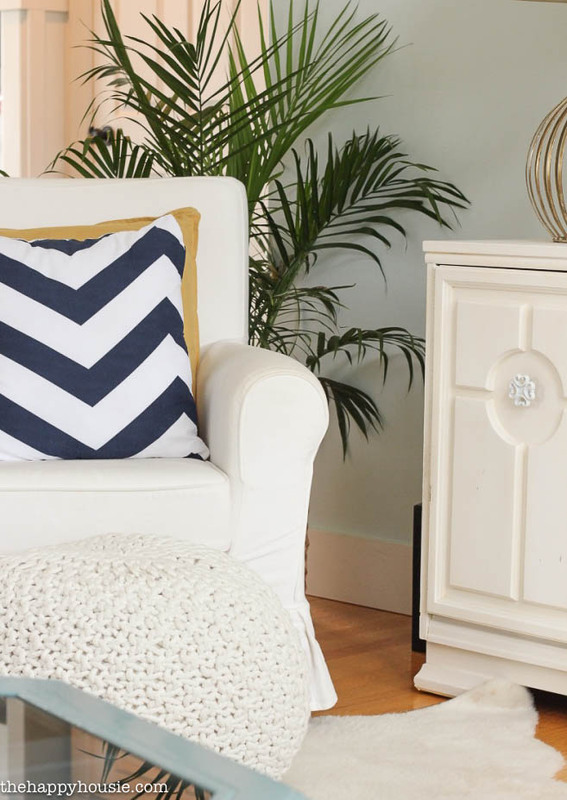 I’m obsessed with those navy and white chevron pillows! The whole room looks lovely; well done! Oooh you had me at navy! 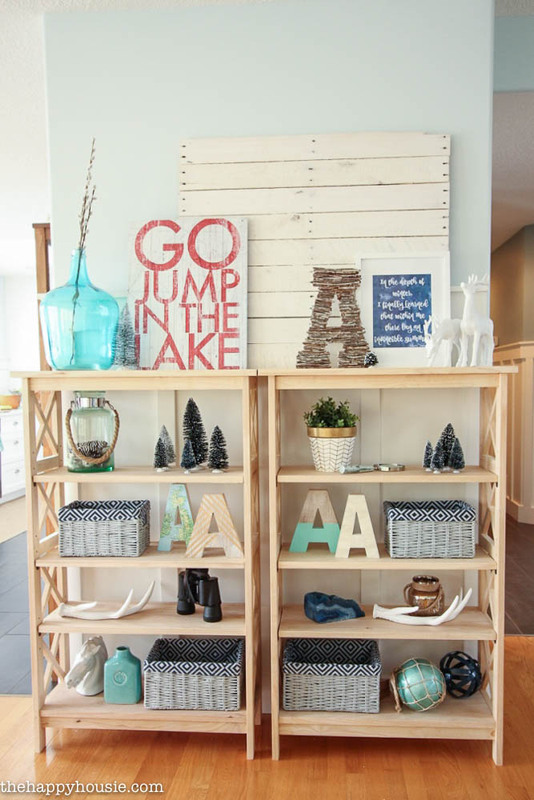 Absolutely love this refresh, Krista! Thank you Abby! I’m loving the crisp navy and white – so fresh for our dull grey winter:) Thanks for popping by! This is so gorgeous, Krista! 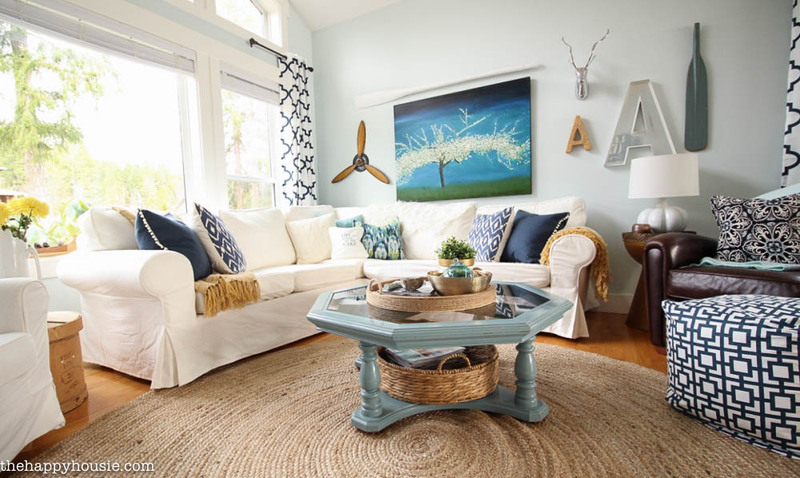 The navy pops so perfectly against the crisp white, and I love all of the thoughtful coastal details you’ve brought in. Amazing job! Thank you Corey! 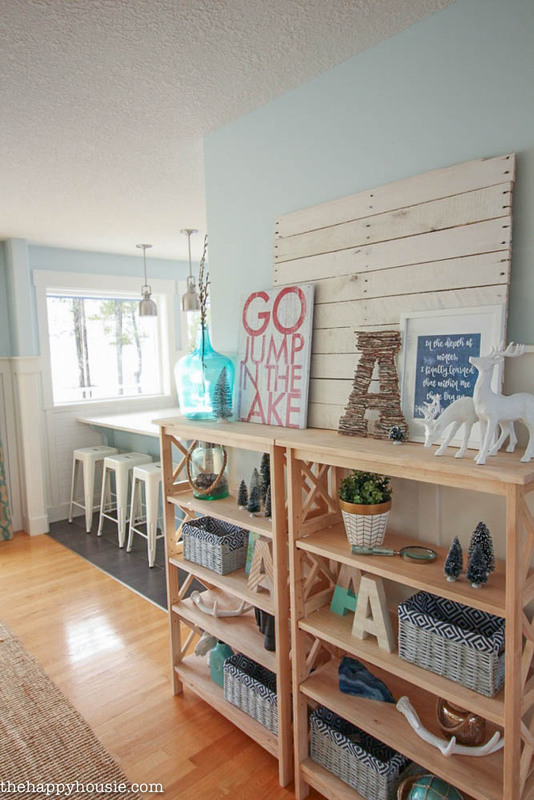 I try to get a coastal cottage vibe without being too over-the-top about it. 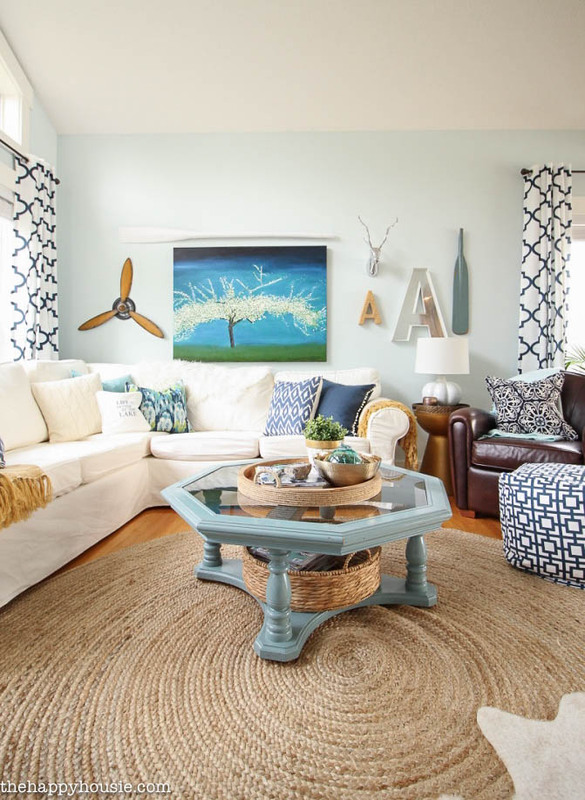 It definitely feels more coastal with navy, I think:) But I love the crisp contrast of the navy and white as well. Thanks for coming by! 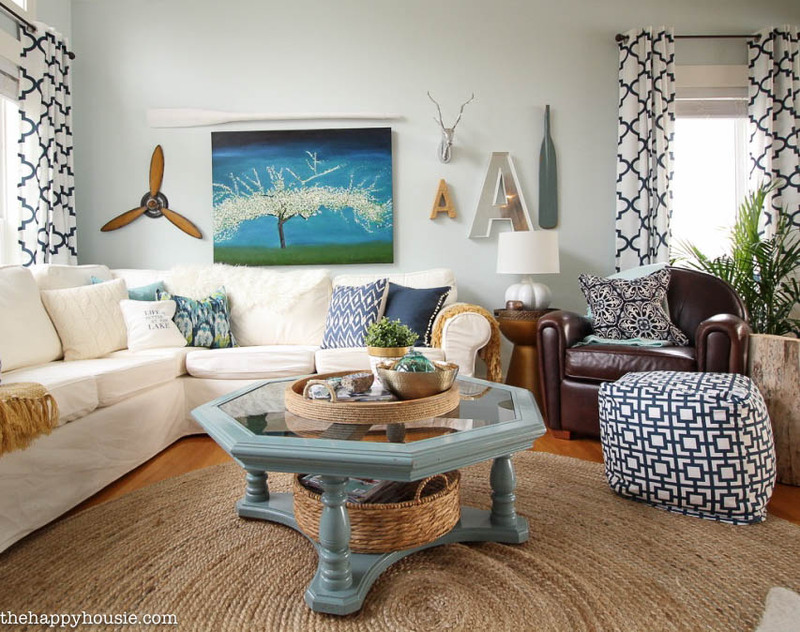 Krista, this space is just gorgeous!! It looks like it just stepped right off the pages of a magazine! Is it weird that I totally want to move in with your right now?!? Your home always looks beautiful but I am absolutely loving these updates! Thanks Jo-Anne:) White can be a little tricky – but at least all the slipcovers are easy to wash! Hello Ardith! 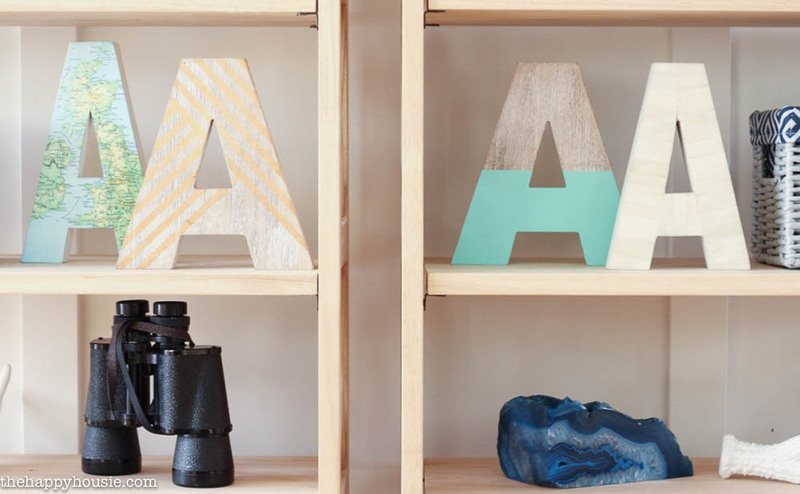 Thank you so much:) I know what you mean about the white for the shelves – even though I think the greyed stain would be pretty, part of me thinks they should be white as well… that’s why I didn’t want to rush into the decision. I don’t really want to do the job twice:) Have a great day!! Wow, nice job! It looks so inviting. It’ll make those grey coastal days much more endurable. Love it. Thank you Erika- I totally agree. It feels crisp and fresh inside so I can forget that I haven’t actually seen the sun in weeks:) lol. Thanks for your visit! Hello. 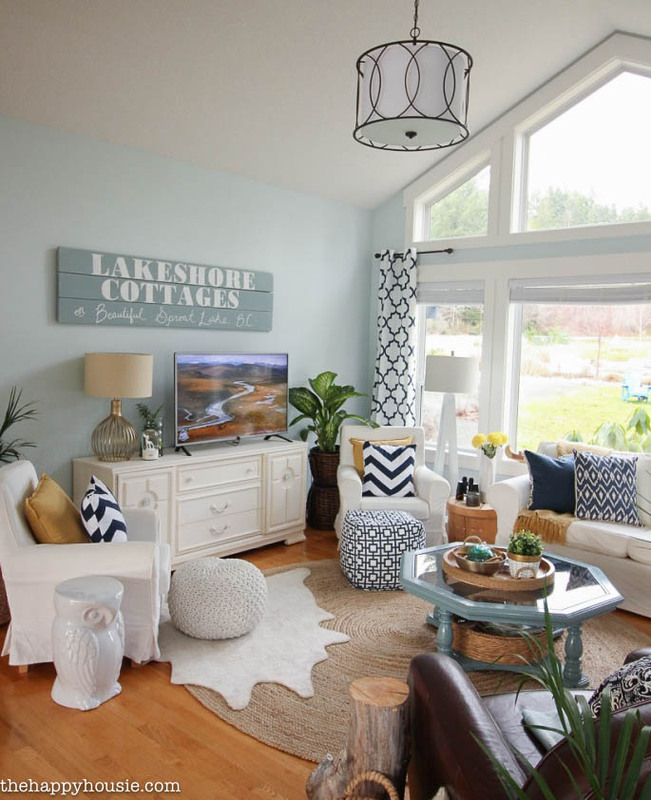 I love visiting your blog and was used to the other colors with had on the living room, and used to thing that it was so pretty I wish I had one like that. BUT… this reneweal is great! Is so much better! Has style and is lovely! You have my vote! Hi Maria! Aw, thank you! 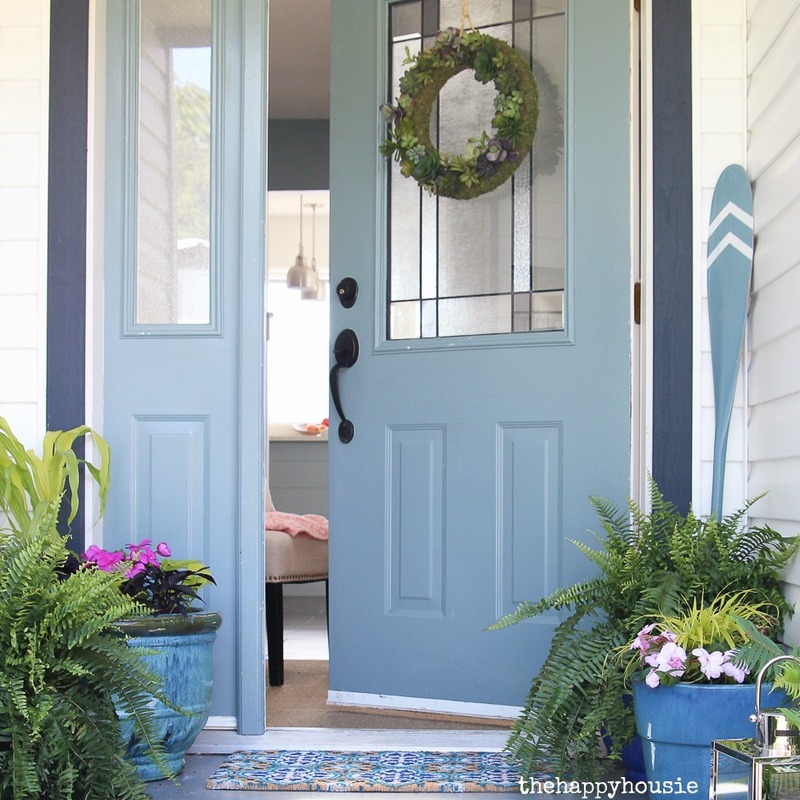 I feel the same way – I loved our old living room colours but once I put all this navy and white in instead, I was shocked at how much I love the change! I think the white background on the drapes makes a big difference. Have a lovely day!